Third Coast Rhythm Project Volunteers are essential to the success of the festival! 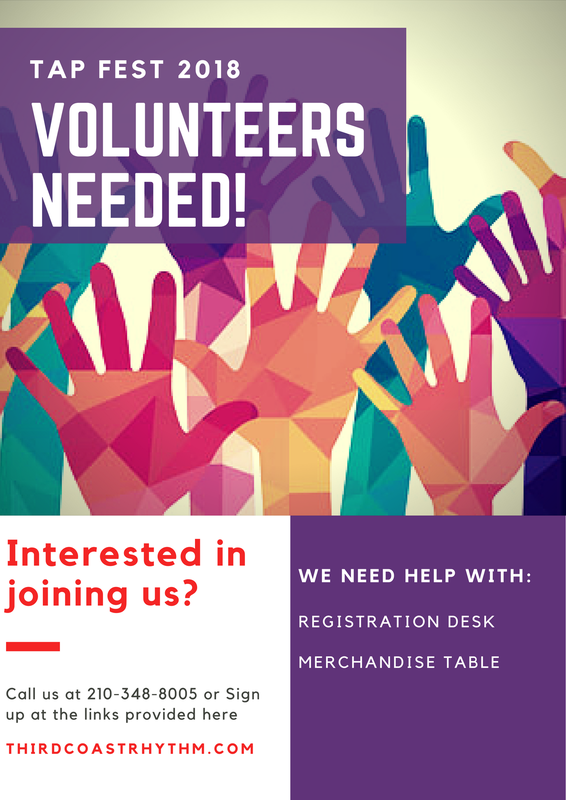 TCRP is seeking volunteers to lend support by sharing your time with us during the festival this year. This is a great way to tap into your community! You will meet some great folks and see some amazing tap dancing! Third Coast Rhythm Project presents a buffet of international and nationally acclaimed rhythm masters in a 4 day extravaganza of American Tap Dance and Contemporary Percussive Arts. This unique event attracts dancers, choreographers, educators, musicians and rhythm explorers from around the globe every summer to study, share, and fine tune their craft. The Festival, now in it’s 21st season, will take place July 26 – 29, 2016 in the Alamo City, and includes 60 workshop classes for all ages, including, choreography, youth Program, jam session, participant showcase, and a one of a kind gala concert performance featuring the distinguished guest artists and the best jazz musicians in the southwest. It’s easy to sign up online. Links provided here.